How to Find the Perfect Airbnb and Make the Most of Your Travel Experience. About this post: How to find a good Airbnb? Is Airbnb safe? Is Airbnb reliable? After several years of using and loving Airbnb on my travels, I’ve penned all my Airbnb advice in this post – including how to find a good Airbnb, Airbnb tips for guests and how to determine if your Airbnb will be safe and reliable. You can also read my Airbnb blogs for Europe, Sri Lanka and Central America with my top Airbnb picks in each region. I often wonder what makes a travel experience truly unforgettable. Take my recent trip to Georgia (the country) for instance. When our plans to travel to the remote Tusheti region got snowed on, we decided to visit a forgotten protected reserve near Georgia’s border with Azerbaijan and the Dagestan province of Russia. I was recovering from a flu, and even on a sunny day, wrapped up in layers and a warm hat. “Cold?” Otto, our potbellied, jolly Georgian host asked me. I solemnly nodded. He turned to search for something in the shelves of his outdoor kitchen shed. I tried to tell him I had already taken medicine, but he wouldn’t stop. He finally found what he was looking for. A bottle of homemade chacha – a strong plum liquor ubiquitous in Georgian households. “Chacha very good,” he said, even as I resisted it at first. Then we cheered to India, Georgia, family, religion (even if mine is atheism) and good health, and downed shot after shot. With my Georgian host Otto. I guess the flu, hiking to the waterfalls in the protected reserve, my friend’s tumble into a glacial river and all the homemade jams we ate for breakfast will gradually fade away in my memory. But I’ll never forget sitting in that little shed by the garden, surrounded by grape and plum vines, the warm sunlight pouring in through cracks in the tin roof, drinking chacha with Otto. So if you ask me, the most unforgettable travel experiences are the ones that push us beyond our comfort zone, happen outside of planned itineraries and immerse us in the local way of life. And for that reason, I’ve sworn by Airbnb in my last three years of traveling. My dreamy Airbnb in the Caucasus Mountains. The thing about traveling is, one size doesn’t fit all. I might love spending time in an obscure little village deep in the mountains and you might love the vibrant night life of a city. I might love slow days with no plans and you might love road tripping from town to town. 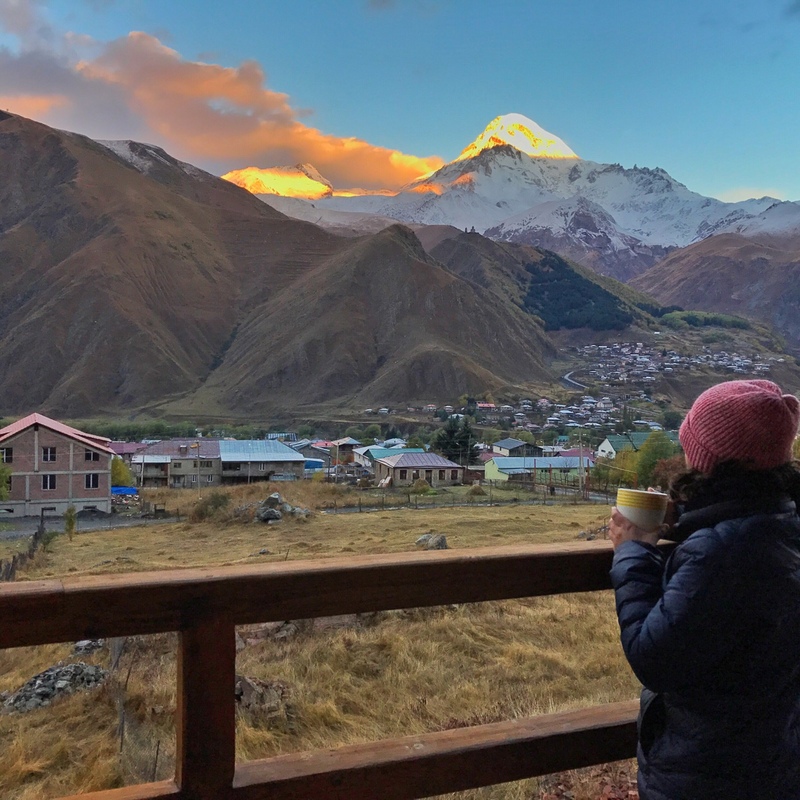 The good news is that accommodations on Airbnb tend to offer a rather vast range of experiences – from swanky apartments with a kitchen (ideal for a long stay), to a homely room with a local family (great for local insights), to a unique mountain lodge that is an experience unto itself. Before I even start looking at Airbnb, I think about what kind of place I’m keen to stay at. If I’m merely passing through a city, I prefer to stay centrally and don’t care much to find a host who’d be very involved. On the other hand, if I’m slow travelling through, let’s say small-town Italy, I’d look for a quiet place with beautiful surroundings, ideally with a host who would be open to conversations and sharing a glimpse of the local life. Before you begin your research, take a moment to think about what you really want from your trip. A charming home to slow down, in Addis Ababa. Typically when you search for a destination on Airbnb, the most reviewed accommodations show up on the first few pages. Unexpected gems can often remain buried on further pages. To get around this, I use the map feature that accompanies accommodation search. By checking a box under the map, I ensure that search results change in real time as I move or zoom into the map. On my Sri Lanka trip last year, I knew I wanted to stay in the hill country, yet not in the busy town of Kandy. So I zoomed into the map, but away from the cluster of Airbnbs in Kandy, till I found one isolated Airbnb on the shores of the magnificent Victoria Lake – it turned out to be one of the most stunning Airbnb experiences I’ve had yet. On the other hand, while looking for an Airbnb in Colombo, I had no idea which part of the city I wanted to stay in. So I moved the map around, looking for green areas not too far from the city centre, and ultimately found College House in a neighborhood I had never heard of before. The point is, the map feature allows you to find Airbnbs away from the tourist action (or in the middle of it, if that’s your thing), and often in small towns and villages that might not be on your radar otherwise. Waking up in a wine barrel bed in Ljubljana! Entire place or private room. I’m not one for sharing a room, like ever. Kitchen, if I intend to stay longer than a week. Superhost, just to get an idea of the top-rated accommodations at my destination. I almost always use the price filter too, but I usually keep the upper range 10-15% higher than my actual budget, since it’s often possible to get a discount on weekly and monthly prices, off-season travel and solo occupancy. Sleeping under the stars, on the roof of my Airbnb in Mauritius! Once I’ve shortlisted 5-10 accommodations, based on the kind of experience I’m looking for, location on the map, amenities and price filters, I start reading the accommodation and host description, and looking at photos. Over the years though, I’ve learnt to take photos with a pinch of salt – they often tend to be edited for perfect light. I try to ignore artistic photos, and analyze instead how spacious the room looks, whether the surrounding area offers natural beauty, and most importantly, if the bathroom looks clean and modern enough. The last thing I want on my travels, is to pay to stay in a dingy room with a filthy bathroom – which has happened by the way. But what I rely on most are the reviews of past travellers. I look at what aspects of a place most reviews tend to praise – the hospitality of the host, the location, the surroundings or the room/apartment itself – and assess if those are the ones most important for me. I pay close attention to anything negative, especially if it concerns cleanliness. An eagle’s eye view on Lake Atitlan (Guatemala) from my balcony. I think the best part about Airbnb, as compared to other accommodation websites, is that you can have a conversation with your host before you book. I always do that, asking questions that are unanswered in the description, like whether I’ll be able to get around without a car, my options for food (and the availability of vegan food), if there are hiking or cycling trails and other activities to keep me busy for a while, and if the internet usually works well. Asking such questions also gives the host an idea of what I’m looking for from my stay, and such discussions have often led to hosts going out of their way to create experiences for me. On the Croatian countryside for instance, I stayed at an Airbnb with little public transport connectivity. My hosts not only picked me up from the train station, but also invited me on their day off to show me their favorite spots along the Istrian peninsula! With my Quichua host family in Ecuador. Time and again, my Airbnb hosts have gone beyond a business relationship to invite me into their lives. Many of them became good friends over the course of my stay, some invited me to come back and stay as a personal guest, others I still keep in touch with and hope to see again. But these relationships are always a two-way street. When I arrive at an Airbnb, I remind myself that I’m not in a hotel but in someone’s house. If the host is up for it and I haven’t had a very long journey, I try to keep my first hour or so for a get-to-know-each-other conversation. These conversations often reveal amazing personal stories and great recommendations in their neighborhood. I keep myself open to tea or meal invites, or join my host for a day out, but never try to impose on their lives. I try to be accommodating, ask politely for anything I need (just like I would in a friend’s or relative’s house), and make sure I adhere to the house rules and keep my space clean. Little gestures go a long way. Over the course of my travels, I’ve realized that most Airbnb hosts are not in it just for the money. They are people like you and me, who love to travel and share their part of the world with those passing through. I’ve heard some travellers say they feel frustrated with Airbnb because the reviews sometimes seem too positive – travellers are worried about hurting the hosts’ sentiments after building a personal connection with them. I understand their frustration, and believe it’s up to each of us to keep the Airbnb spirit alive – by being honest. On my part, I ensure that my Airbnb reviews are as helpful as possible, without being too flowery or brutal. I highlight aspects of the place I loved, and those I believe could’ve been better. Genuine feedback can enable hosts to offer better experiences, and manage expectations for future travellers. After all, we have to rely on each other, the travel community, to discover travel experiences that are truly unforgettable. Do you use Airbnb on your travels? Any tips on how to find the perfect place to stay? I wrote this post in collaboration with Airbnb India. If you haven’t used Airbnb before, sign up with my referral link to get 18$ off your first stay, and use it to find local experiences the world over. Oooh lovely scenes and wonderful tips. Truly helpful. Thanks for your informative blogs. Its a pleasure to read them. I recently discovered Airbnbs and love all they have to offer. Great tips and ones I’ve also found useful. Glad to hear that Linda! I’ve had tremendous luck with Airbnb. These are great tips and it’s certainly worth the effort to put time into doing research. I’m going to check out your Sri Lanka recommendations as it’s high on my list. Thanks! By the way, love your photo and story with Otto. It was such fun hanging out with Otto and his quirky ways. I loved many of the Airbnbs I found in Sri Lanka, I’m sure you will too! I use airbnb a lot first as guest and now also as host. I use the same filters you do and pay close attention to the ‘negatives’ in a review. As a superhost myself, I tend to look for those listings by superhost but also give new hosts a chance, with some hits or miss. I guess being a host must make you pick even better Airbnbs as a guest! What’s your listing btw? Wonderful places to stay. 🙂 And thank you for all the vital information and tips on airbnb. Hope they help on your next trip, Moon! A really useful post Shivya. We also use Airbnb, mostly in large cities – it gives us the chance to stay in the heart of the city and also some extra space for my daughter to run around. Thanks for the tips. They surely gonna prove helpful for many. And your eloquent article is complemented with eye-catching images. Wonderful. Glad to hear that Sherab! Dont you find airbnbs expensive? Especially in places like Thailand, Indonesia in the cost of an airbnb, I can manage my entire day. Are there any hacks for cheaper airbnbs? Where are you based when you aren’t travelling!? Just curious 😊 do you travel 365 days a year? The post comes at a time when AirBnB is under attack internationally for not having safety policies in place – and safety for both guests and hosts. What’s your take on it? It is good to see that you have had a safe and happy stay throughout. Good luck. I stayed at the same wine barrel airbnb in Ljubljana! Before going, I tried to find an article about Slovenia in your blog, since it seemed from your pics that you’d been there but couldn’t find any. I have fallen hard for this country’s quirky capital and picturesque countryside and would love to see and read your take on it! Previous PostAn Unfinished Affair: Places I’d Love to go Back to Someday. Next PostGeorgia E-Visa for Indians: Is it Worth the Hassle?